How Long Is Too Long To Charge An Electric Car? News that 200 electric car quick charge stations are to be installed in Japan introduced us to the concept of a "quick charge" of 5 minutes for 25 miles or 10 minutes for a whopping 37 miles of range. Of course, there's really no definition for what a "quick charge" is. The G-Wiz takes six hours to charge and it goes 40 miles. 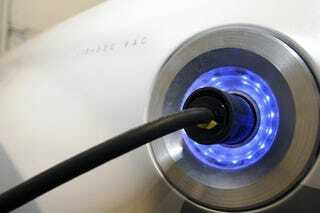 The Lightning GT claims 200 miles on a 10-minute charge, but we haven't seen it in action. Given that an average car will go around 300 miles after a five-minute fill-up, are we willing to wait that long to go a twelfth of the distance? How long is too long to wait at the pump-plug?